For more information on Application Lifecycle Management and how to gain an advantage from application modernization, please click here. 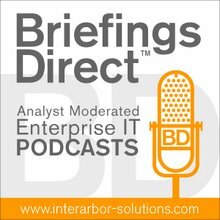 The latest BriefingsDirect podcast discussion examines a new book on application lifecycle management (ALM) best practices, one that offers new methods and insights for dramatic business services delivery improvement. The topic of ALM will be a big one at next week's HP Software Universe conference in Barcelona. In anticipation, join us as we explore a new book on application lifecycle management (ALM) best practices, one that offers some new methods for overall business services delivery improvement. Complexity, silos of technology and culture, and a shifting landscape of application delivery options have all conspired to reduce the effectiveness of traditional applications approaches. In the forthcoming book, called The Applications Handbook: A Guide to Mastering the Modern Application Lifecycle, the authors evaluate the role and impact of automation and management over an application's lifecycle, as well as delve into the need to gain better control over applications through a holistic governance perspective to help head-off poor applications productivity. This is the second (read more about and access the first podcast) in the series of three podcasts on the "Application Lifecycle Management" book. We're here with the authors, but we are also here to learn about how one enterprise, Delta Air Lines, has moved successfully to improve its applications’ quality and impact and to better deliver real business results from those applications. So please join me now welcoming our panel, David Moses, Quality Assurance Manager for Delta’s eCommerce IT Group, and John Bell, Senior Test Engineer in the eCommerce IT Group at Delta; book c0-author Mark Sarbiewski, Vice President of marketing for HP Applications, and c0-author Brad Hipps, Senior Manager for Solution Marketing at HP Applications. The discussion is moderated by BriefingsDirect's Dana Gardner, Principal Analyst at Interarbor Solutions. Sarbiewski: The headline for me is that, more than ever, business moves as software moves; as your website moves, as your E RP system is advanced, your supply chain, and your financials. Businesses are driven so much by software now that it's really the long pole in the tent. Standing up infrastructure is a necessity. Potentially, it can be done really fast. How quickly can I innovate on my capabilities for my customers or my internal users? So, business moves as software moves. When we look at how we've done over the last 10 or 15 years, I could sum it by saying that legacy applications and approaches are just too slow. Not only are they too slow, they are too costly. They're riddled with security holes, which are increasing the challenges out there. So, we have this dynamic that the business needs to move faster. Software is a prime driver in innovating for the business, and where we've been is simply too slow. We need to rethink our approach across the board, because there is no one silver bullet. It really boils down to I have to leverage the latest technologies for things like reuse, where I get huge leverage for richer customer experiences that need those wonderful new web application technologies that we have. I have new processes that I can leverage in forms of agile and iterative types of things. To keep the cost in line. I really want to be able to leverage global teams for flexible low cost, but expert resources around the globe. I want them acting as if they were all local, like a dynamic Tiger Team that was all local. That’s a lot of change to make happen to serve the ultimate business needs. We took the opportunity to take a step back and ask how all these things come together and how you can blend this modern approach to really deliver what you need to deliver for the business. Hipps: This is a chance to take a step back and have a bit of brain space to consider and contemplate a lot of thin gs Mark just touched on -- what are these ramifications for my organization? Nine times out of 10, most of us who are in IT developing applications, trying to get on top of what it is the business wants, don't generally have the luxury of taking a step back and asking has the ground shifted underneath my feet with regard to all the things I am now expected to do and the ways I am expected to do them, whether that’s process shifts, organizational shifts, or technology shifts. Generally the case is that the ground has shifted. Am I equipped, organized, and oriented to respond effectively to all these changes? That’s one of the driving factors of the book and one of the hopes that gives people a chance to step back, contemplate what these changes have been, and also give a bit of guidance about how we might better get on top of these changes and really wring the benefit out of them that we had expected when we first began to make them. Moses: The biggest thing that we have at Delta is to make sure that we innovate for our customers a nd give them the latest greatest ability to take control of their situation. If somebody wants to book a flight, they should be able to do it on any media they like. We want them to be able to make it in as few clicks as possible and as little typing as possible. We really want to make it as convenient for the customer and through the entire experience from the inspiration, all the way to when they are back home. We want to deliver quality products to them. That comes down to innovation and speed, because you can innovate for ever and never actually release the product. For us, getting it out the door is very, very important. Some of the things that we've heard already from Mark and Brad touch on the need to back away, get out the weeds, and look at your overall lifecycle to make sure that you can get that speed. A lot of times, if you're doing the status quo over and over again, you never realize how fast you can be. So, you raise your head up, look around, and try to make some big changes. Complexity is always the enemy of speed and innovation, isn’t it? The idea is to make it as simple as possible by having one version of the truth. You really have to get to that point, a central repository of data, a central tool that everyone can use. We use Quality Center. We keep everything in that, requirements, tough cases, automation. We pull scripts and things from there for our test plans. We have one area with all that data, so all of our areas can come to that and pull that information. Whenever somebody needs to start up a script or anything like that, they’ve got a library that they can pull from. They can bring it into their project. When they are done with their manual testing and they place their test plan back in the library, they can then take those pieces and immediately automate them. Somebody once said they required a form to find out who they were going to, or what pieces they were going to automate. For us, if you have one version of the truth, you know when things are checked back in. You know when your test plan has been updated and your automation people can make that decision. So, it's about getting rid of all the clutter, reducing the complexity, having simple processes, getting rid of all the ones that don't matter, and just really streamlining. Recently, we've brought in some of the mobile devices like the iPhone and some of those types of applications. In the past, a large number of our customers have always been using the .com form. Now, we're finding more and more users are going towards the mobile devices. We wanted to make sure that a lot of the applications lifecycle testing we had done with the .com could also be used with the mobile. We were able to take automation and a lot of the test cases and type things we had used with .com and use it with mobile. We did write automation associated with mobile and were also able to bring that back into Quality Center, running that via Quick Test Pro. Even though mobile was a newer area for us, we were able to get the speed to market up on that as soon as possible. Also, we were able to leverage that and use some of those automated scripts. We run those on a daily basis against our production mobile environment. If something is wrong with that, we know early in the morning. We run these scripts early in the morning before we come in, and we can know right away if something is there. They can go in and determine what new requirements they need to make and what enhancements they want. It's really helpful. So we were able to take the lifecycle information and the wins that we have got from the .com, and bring that into our mobile apps, and it's really helped us a lot. Our speed to market has significantly improved with that. Bell: Another case would be our new homepage. We're sitti ng here at the end of 2010. About two months ago, we released a new, more streamlined homepage, a lot more innovative. A lot of people looked at that. We hid the logo during usability testing, and people were surprised to find out it was an airline website. They thought of us as one of the cool guys out there in the travel world. We're getting much better in this area. By using all the feedback that we get from the customers, importing information in the Quality Center, tracking everything that we have in there, we were able to look at what we needed to make changes to. Once we released this, it was something that the customers were wanting, so it got a lot of good response. ... One of the things that’s really important to us is that we work with multiple vendors in multiple locations and with multiple time zones. It's important to make sure that all of them are using the same processes and that we're all using the overall tools. We use quality center personally to help organize a lot of the requirements and things like that in our testing efforts. It's important that all of our vendors, whether it's in-house or people outside, are giving us the same processes and that we are able to leverage any of our automation or any of our business process testing or any of those tools, and that we can actually deliver high quality software quickly, can reduce our turnaround time, make sure that we're giving customers their best experience, and that we are getting our time to market in a timely manner. Moses: It's truly huge. I mean if you look at Delta.com, it's the main revenue driver for the entire company. So it's our face to the world, and streamlining that process where people are making it better and making the customer experience better is our number one goal. We want to really give our customers what they want and make it easy for them, because we have a wide range of customers. We have pleasure customers who travel with their families once or may be twice a year, sometimes even less, and then we have people who travel with us every week. So we have two very different types of audiences and we have to cater to both. We have to make it fast and enjoyable and we have to allow them to dream a little bit and be inspired by where they want to go. It's one of the biggest things that we have on our plate with mobile. Mobile is the future. Everyone is going toward mobile devices and portable devices. You're seeing more and more iPhones, iPads, and Android devices out there in the world, especially when you walk through the airport. We don't like that it happens, but sometimes things are out of our control like weather. And, we are always safe, so these things impact our schedule. Hipps: In the book, when we talk about the core lifecycle, historically the SDLC -- we just call it the core lifecycle, so as not to get lost in alphabet soup. Within that we see traits among world-class organizations. There tend to be four traits that these world class organizations have mastered, and we list these traits as being change ready. They have a high degree of predictability, high degree of repeatability, and certainly their output is of high quality. So those four: change readiness, predictability, repeatability and quality, tend to be abstracting some traits that we see across these great orgs. Those tend to be the key ones that really they are very effective at. David and John have talked about that we have got data points in each one of those, in some of the examples they have given. A lot of this change readiness to a large degrees is formed by the point that we made in the beginning in the podcast, which is that fundamentally everything that business wants to do is going to have some applications or set of applications behind it. There is going to be a dependency there. The business is only as nimble as its applications are. That puts applications teams in a position where they are not holding the business off at arms length, and saying, "No, no, no, no, no, I can't do that. No, that will take months." That rigidity may be historically where we came from, when we had fewer applications. They changed less. They were much bigger, more monolithic, and brittle. That is not the world we live in today. Today, change is the expectation. David and John have been talking about this code being lead revenue generator and Delta.com being the lead source of revenue on the Delta side. It's a great example. Clearly, anything the business wants to do to advance its market presence is going to come through that application. You’ve got to have that one version of the truth. I would highly recommend getting that, the central tool that everyone can use and that you can put everything in. The fact that they have leveraged automation and asset reuse and taken the time to build requirements traceability are all tick marks you put against organizations that have configured themselves to be change ready. That means they have stripped out as much latency as possible, the time it takes to do impact analysis. They can see pretty quickly what all the dependencies are as a new change comes across. That’s just speaking of the assessment. There is, of course, the execution, which depends on automation, asset reuse, and all the things they talked about. We probably covered four of those, but certainly the change readiness does stand out. Moses: You have to have that one version of the truth. I would highly recommend getting that, the central tool that everyone can use and that you can put everything in. Second, it’s about mindset and alignment to your goals. You have to have alignment to the customer. You still have to have department goals, but they should be aligned to what the customer needs. A lot of times, you see a contradiction in goals between the business group and an IT group. Delivering what the IT group wants to do may not exactly get what the business wants. And if the business was focused on the customer and the IT groups are focused on how many projects they can get out, but doesn’t really matter what projects they are, then there's an issue. So, you have to really align very closely between business and IT, so much so that if you even have something that is a huge impact to your company, you may want to wrap a special forces team or integrity team around that, and have that group be one. Business and IT all in one group -- that way you completely eliminate the us-versus-them mentality. If you can’t do that, definitely make sure that you're aligned to the customer. Bell: One thing to add to that is that, at first, it can be a little scary moving things in, like moving all your requirements into one area and getting all the test cases and things and even looking at automation. Sometimes, you have to take a half step back in order to take a full step forward. With us, even as we were moving things and centralizing it, there could be a little pain point in doing that, but that pain point will more than payoff in the long run. A lot of the people who are holding on to the old methodologies and ways of doing business, are thinking, "We're going to have to take a step back to do this." You're going to get that money back, plus your time, so quickly that you will be shocked. Whatever step you take in that direction and whatever pain point you take as you move forward, once you start getting the automations in place, once you get these tools in place, you’ll see that you can start moving faster and faster that any initial pain point you took. You're going to exponentially get that money back, plus your time, so quickly that you will be shocked. Just look at the changing world that we live in. With Delta.com now, we live here in Atlanta. If you go over to the airport, you realize that our business is not just flying customers within the United States in English. We now have kiosks in six different languages, and you meet people from all over the world that are now using our products and our websites in everything from simple Chinese to French. It’s important that we realize the global nature of what we are doing, and that our methodology and our IT departments have to align ourselves, so that we can move this quickly. Without the automation and without the centralized tools and things we would never be able to put out as much work as we currently do.